I'm back from the summer break in Indonesia. I apologize I could not visit and reply all the comments from my last post since I had to rush. I thought of replying and reading all the post during the holiday, but it just didn't happen. Now I'm back in the sultry weather of Indian summer. The past few days I was busy with tidying up my home after I read about Konmari method (go and google it :D ). You may have heard, read or saw her post all over social media. I get the drift from what I read on the blog and saw on Youtube so I decided to buy her book. I'm still waiting for it to arrive, so I will tell you about it (hopefully) in my next post! In the middle of the chaos I created, I managed to finished 4 multi zipper pouches, which 2 of them are orders. The opportunity came at the right time, just when I was thinking to sew a few pouches for stock. I was looking and considering a few options. When she DM me on Instagram, she wanted a pouch with multiple compartments and this style is just perfect. I always love to work with new prints. I especially love the snoopy fabrics. I recently got quite a few snoopy prints from my trip to Indonesia just because they are just too cute to pass! Like this snoopy back to school print. Isn't it too cute? I really love this colorful hearts print. This was the first multi zip pouch that I made. The pouch dimension is 8" W x 6.5" H which is so spacious! You can fit in lots of things in there. 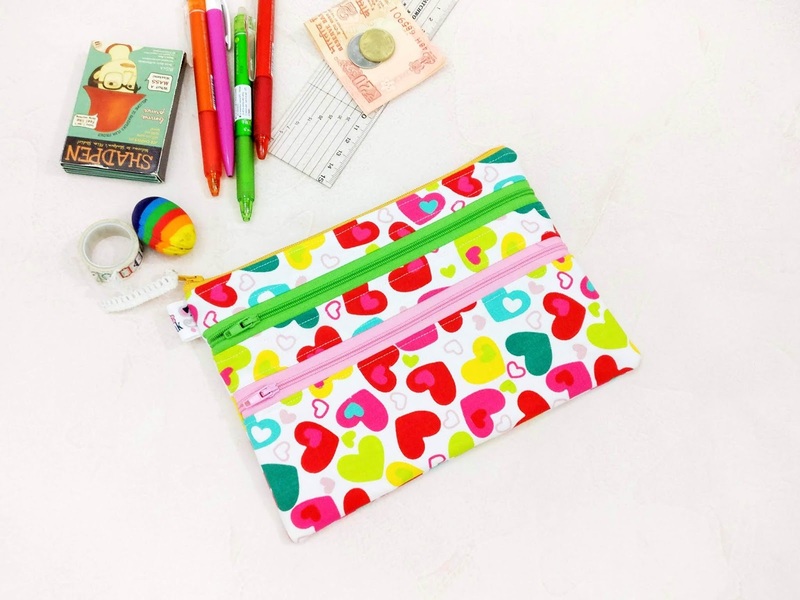 You can even use it as make up pouch or even a passport bag! It simply versatile pouch. What about you? What did you sew this week? This post is linked to these awesome blogs!